Who has the Ur-list of Amitabh-Shashi movies, in order of watchability and rewardingness? Not thinking about it too much, just going with my gut, I jumped right in with the following list,* going from best Shashitabhiness to least good (I won't say bad because Shashitabh has yet to disappoint me entirely). Note that this is not the same order I'd put these movies in for quality or watchability or rewardingness overall OR for quality of individual performances from either of them. This is all about making ultimate use of the ultimate jodi. This will be a much longer post someday, but for now, how would you rank them? * There are still two films I haven't seen (of thirteen total, not counting Bomay Talkie since Amitaibh's scene got cut or the Amitabh-starring but Shashi-directed Ajooba). As for the two films you are missing, Ahsaas has Shashi in two scenes and Amitabh in a special appearance, so they have no screen time together. Akayla has plenty of Amitabh as a police officer who isn't to bothered by doing things by the book. Shashi plays his superior officer and turns up every twenty minutes to admonish him to stick more closely to the rules. Their interaction really isn't that great. However, my judgement may be coloured by the genereal not very greatness of t he movie. 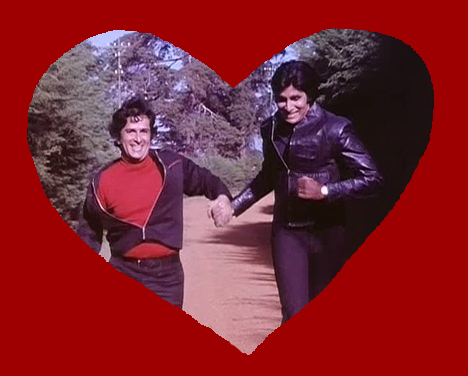 Just the thought that Shashi Kapoor and Amitabh were playing twins in Suhaag cracks me up. I think I've only seen one! Better move some of these up my queue. For me Kaala Patthar would top the list as its their most intelligent collaboration, AND they fight for the rights of the downtrodden with fairly realistic drama. Suhaag and Do Aur Do Paanch would tie for second place on my list, as they are both insane laugh fests. The former may have a slight edge though, as the two looked rather old and tired in the second one. For the rest, I dont have very strong preferences, except that I would take Trishul over Deewar any day, and keep wishing that Silsila could be unmade! well, i never thought about Shashitabh as a concept though i've watched all movies in your list except Imaan Dharam and Roti Kapada. It is really difficult to list rest of the movies as they r more like a part of commercial bollywood movies which try to imitate the 'success formula' of starcast. Ajooba is a terrible drain on nerves and u can just avoid it unless u r a diehard fan of Amitabh! Shaan is my favorite film by the duo. I mostly love the soundtrack by RD Burman especially Yammma Yamma. The picturization of that song is great. Helen joins the whole cast in this well choreographed song. Even Johnny Walker dances a few steps! This is the type of post that REALLY makes me feel like a novice. However, it's also wonderful posts like this that give me the jumping boards I need to dive in. Now I just need more time in the day! hey beth don't watch ajooba as it is a really bad attempt at fantasy . I agree with BV and Gebruss on the general suckiness of Akayla. And I too would put Kaala Pathhar at the top of the list and move DADP down to the second slot to tie with Imaan Dharam. I'd also move Trishul up to the No. 6 slot. Also Silsila and Kabhi Kabhie are both so annoying, why not let them tie at second last too? gebruss - Oh dear! V disappointing re: Ahsaas (though good that that's one less movie I need to track down). Akayla sounds like the kind of thing I would not bother with unless it had particular appeal. Hmmm. Anarchavist - There are a lot, it's true! Hurrah! Yunus - It's fun, isn't it? :) I love them as twins too - it's good to keep our disbelief-suspending muscles in good working order. Bollyviewer - you're totally the master of this topic! As for the top three, I can easily imagine I might put them in different orders depending on my mood. I suspect they have more time actually together, or responding to one another, in Do aur Do Paanch, and it's all so funny or awesome in some other way, which is one reason I put it at the top. I need to see Trishul again (and find a copy with better subtitles). Most of what I remember is Shashi's ENORMOUS movie-star grin and tight-bell bottoms. Mister Naidu - I like Shaan very much as a film, but I feel like Shashi doens't have a lot of presence in it, so I couldn't put it high on this particular list. But as a movie, yeah, I love it! Did you see the "Yamma Yamma" duo on Boogie Woogie awhile ago? So fun! shell - C'mon in - the water's fine! proneD - too late! I already like it. I think Aladin looks really fun; I'm especially happy to see Ritesh in a lead. indiequill - Sigh. The list of watchalong-able things just grows and grows and grows. What about the 1978 film Nasbandi? Kaala Patthar and Namak Halaal is my favorite Shashitabh films. Heehee those are imposters :) I love that clip!